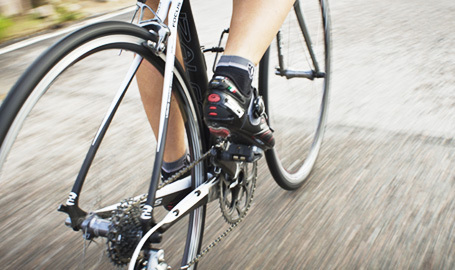 In cycling your power and control are determined by how well your feet interact with the pedals. Footbalance custom insoles support your feet properly for better power transfer and efficiency while maintaining good circulation and comfortable feet while bike commuting, road racing, mountain biking or downhill riding. Misalignment in the feet and ankles affects overall body alignment and efficiency, negatively affecting power transfer, comfort and endurance. During cycling your feet pedal from 80-100 revolutions per minute. Unsupported arches collapse in with each stroke, decreasing power transfer and efficiency. The hips and knees turn inward, causing poor form, back pain and further loss of power. At over 3600 to 5400 pedal strokes per hour this leads to repeated stress on the ankles, knees and hip, injuries, pain and premature wear on the joints. Cycling cleats form a stiff platform to improve energy transfer. Unfortunately this stiffness can pressure feet inward even more, causing pain or numbness over long distances. This effect is worse when you undersize your cleats, or when they don’t conform to your individual foot shape. Footbalance custom insoles support your feet in proper alignment to help you improve power transfer and efficiency, ride more comfortably and prevent repetitive stress injuries. Your body mechanics improve when your feet are properly supported and aligned. Overall body alignment and form become more efficient, conserving energy while prevent stress injuries and premature joint wear. The arches don’t over collapse, and you get better forefoot balance. Unnecessary pressure on the feet decreases, facilitating good blood circulation for a better, longer ride. Our custom insoles improve feel and reduce ‘slosh’ without the need to undersize your cleats. You get the right stiffness to channel maximum power to the pedals. You can improve the performance of softer cycling shoes and make racing cleats more comfortable.